Daniel Dancer has been spreading his message to schools around the country for 17 years. 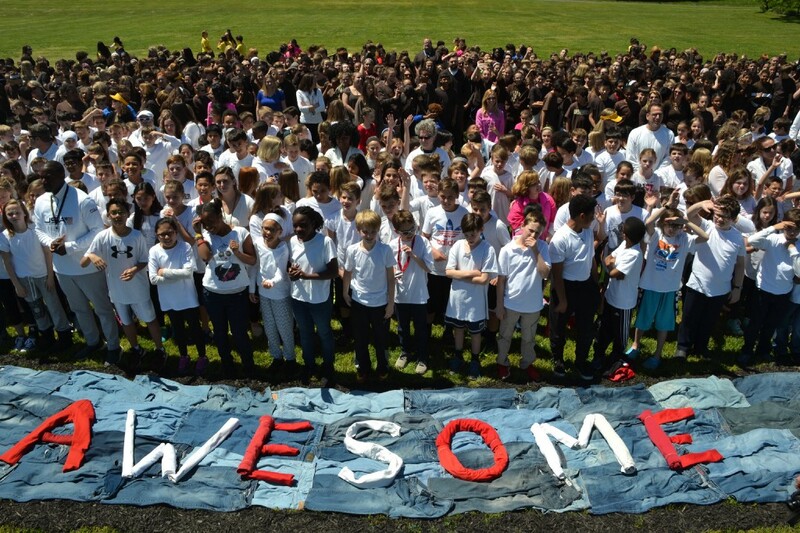 Moorestown Upper Elementary School students file in the birthday cake design that artist Daniel Dancer laid out as part of his “Art forthe Sky” series. Dancer chose a birthday cake design because of Kid President, who encourages everyone to treat others like it’s their birthday. Daniel Dancer’s “Art for the Sky” is about more than just creating an image. It’s about bonding, creating memories that last a lifetime and teaching students to see the big picture. Dancer has traveled to schools in 42 states and eight countries over the past 17 years to create sky art with the help of students and staff, and last week, he visited Moorestown Upper Elementary School for the second time. On the day Dancer arrives, he hosts a school-wide assembly covering climate science, the importance of developing a relationship with the sky, the history of sky art, logistics of the project and what he calls the six teachings — intention, collaboration, interconnection, sky sight, gratitude and apology, and impermanence. “These images are too big, they don’t make sense on the ground,” Dancer said. He encourages students to use their sky sight to see the bigger picture. Day two is is event day. During the hour-long event, participants wear different colored shirts and come together class by class. Dancer directs from a donated crane, fire truck or man lift — in UES’ case, a Lenola Fire Department truck — while taking videos and photos throughout the event. While Dancer makes the final decision on what the image will be, he lets the students guide him. Moorestown Upper Elementary School students recently read “Kid President’s Guide to Being Awesome” by Brad Montague and Robby Novak. 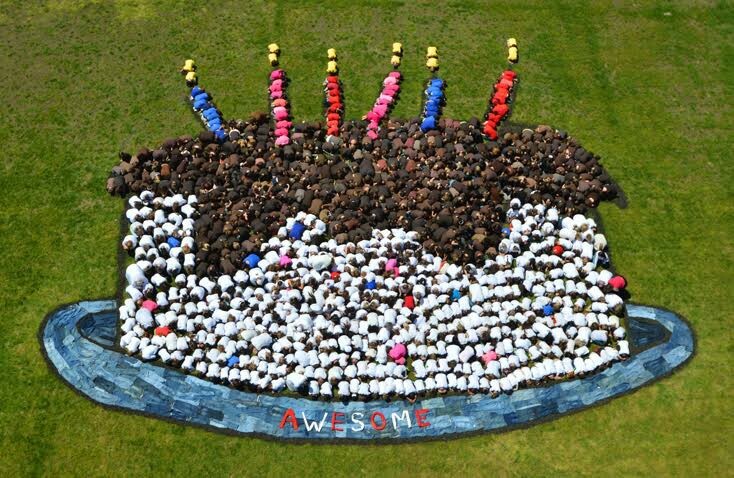 After the school sent Dancer the book, he chose a birthday cake as the image the school would create using their bodies, some mulch and a few hundred pairs of blue jeans. Dancer first crafts a thumbnail sketch, then uses a grid to enlarge it to scale. One inch on paper for the birthday cake was approximately 10 feet on the ground. He marks the outline with mulch so everybody knows where to stand and herds students into the right spot with the help of parents and teachers. 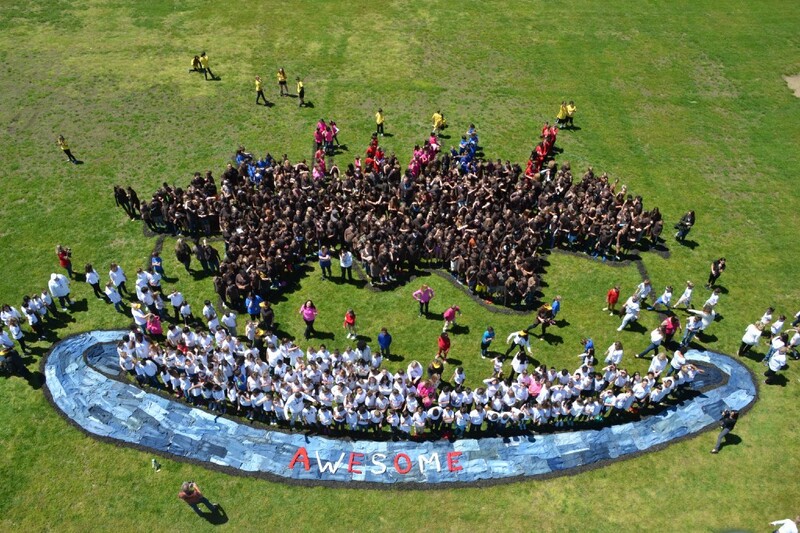 More than 1,000 students and staff came together to create the birthday cake image. Before Dancer takes the final photo, all students and teachers involved crouch down so only their shirts show. Afterward, attendees participate in a minute of silence — something Dancer calls life changing. On the final day, Dancer shares the photos and video with the students during a morning assembly. The school also receives a DVD of the final presentation. The final product. Photo credit: ddancer/artforthesky.com. UES participated in Art for the Sky for the first time in 2014, and Powell says it was so well received she hopes to continue to bring Dancer back every three years so every student who passes through UES can experience the event. For more information, visit www.artforthesky.com.